The mystery of the “bright spots” on Ceres has finally been clarified in two new studies. Footage from NASA’s Dawn spacecraft illustrates (in false color) neon blue deposits of salts in more than 130 locations across the celestial body. 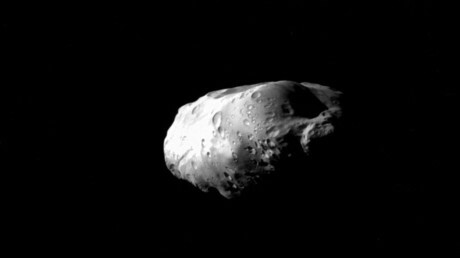 Taken by the frame camera on board the spacecraft, some 2,700 miles (4,400 km) away during a flyover, the photographs depict large deposits of hydrated magnesium sulfates. Known as Epsom salt on Earth, the deposit is widely utilized in many beauty, household and gardening-related uses. The video was released by NASA Jet Propulsion Laboratory to illustrate two studies, one by a team from the Max Planck Institute for Solar System Research in Germany, who counted 130 bright spots across the surface of Ceres, a dwarf planet that is only 584 miles (940 km) wide. The researchers, led by Andreas Nathues from the Max Planck Institute for Solar System Research, believed that the false blue-color pigmentations of salt-rich surfaces formed when water-ice sublimated in the past. They also believe that the deposits were unearthed as the result of asteroid impact on the surface of the celestial body that lies in the asteroid belt between Mars and Jupiter. “The global nature of Ceres’ bright spots suggests that this world has a subsurface layer that contains briny water-ice,” Nathues said. Harboring the most saturated of Ceres bright spots is the 60-mile-wide (90 km) Occator Crater. Scientists have identified the blue light to be a type of hydrated magnesium sulfate known as hexahydrite. 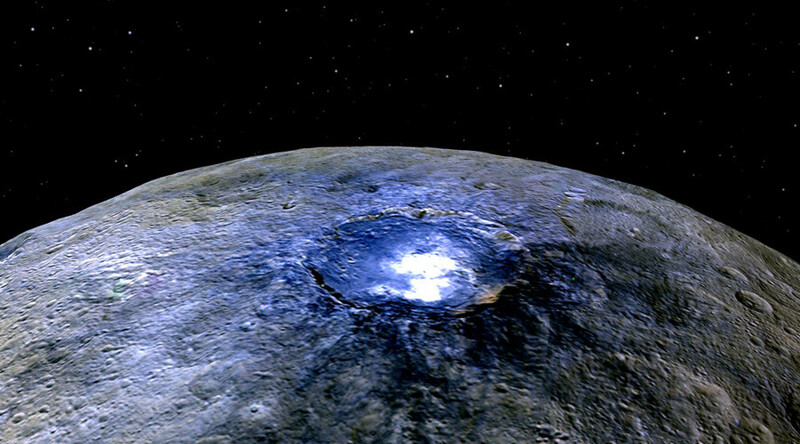 Scientists believe the crater to be among the youngest features on Ceres with an estimate age of about 78 million years old. In the second study, members of the Dawn science team found evidence of ammonia-rich clays. “The presence of ammonia-bearing species suggests that Ceres is composed of material accreted in an environment where ammonia and nitrogen were abundant. Consequently, we think that this material originated in the outer cold solar system,” said Maria Cristina De Sanctis, lead author of the study, based at the National Institute of Astrophysics, Rome. The study also measured the daytime surface temperatures on Ceres that range from -136 degrees Fahrenheit to -28 degrees Fahrenheit, with the highest temperatures measured in the equatorial region.